ITALIAN LEMON COOKIES ARE ELEGANT FOR EASTER, CHRISTMAS, WEDDINGS AND FOR EVERYDAY EATING. THE PERFECT DUNKING COOKIE. Soft Italian Lemon cookies with a lemon glaze and coloured sprinkles are a staple in just about every Italian family particularly those who hail from Southern Italy. Does dunking Italian Anginetti cookies in your morning coffee sound familiar? It probably does if you’re Italian but for those who haven’t you should try it. I promise you these cookies are one of the best Italian cookies to dunk and I’ve had many growing up in an Italian neighbourhood. With Easter (Pasqua-Italian) around the corner I thought you’d all like to try something a bit different for your Easter dessert or before, after and in-between meals. 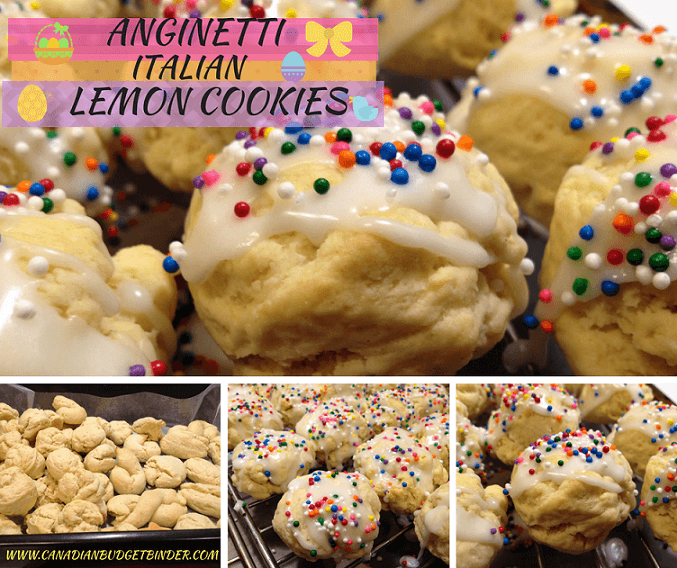 You can pretty much eat these Anginetti Italian lemon cookies all day (at least I can). In my teens I would visit my Italian friend almost daily to hang out and play or swoon over the boys. Her mother would always have these amazing iced Italian cookies that I would drool over. It was like living in a palace and I was jealous because all I got were Oreos from a bag. These Italian cookies with sprinkles on top were big business especially for breakfast alongside a cup of coffee for dunking (especially after a night out at the club). 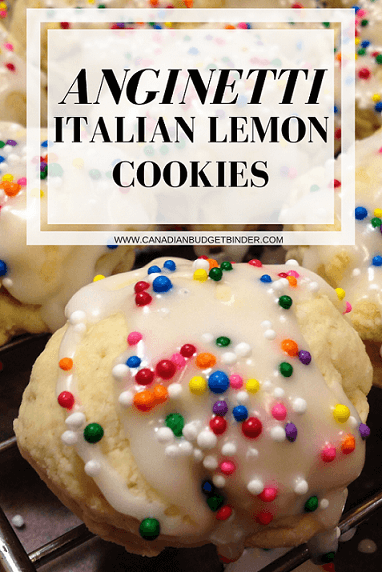 Just about every holiday or special occasion I was invited to with the family you could always bet on there being what became one of my favourite cookies, Italian lemon cookies. I pretty much wiped the plate clean when no one was looking but they always knew who the cookie monster was. When I asked if these Italian cookies had a traditional name I was told there were many. The reason is that each region in Italy name their food differently even though it’s similar. I wanted to give these cookies a shot and bake them for my family and friends with Mr.CBB. After much research I realized that the best person to ask for the recipe was my friend’s mother who is now in her 60’s and an Italian Nonna (grandmother) to 5 grandchildren. Everyone just calls her Nonna so that’s what I do as well. Recently when I went for a visit to catch up I asked if Nonna could make me those Italian lemon cookies and I would bring a batch of our chocolate peanut butter balls. I went to visit Nonna and my friend who was also at her parents house for the Christmas holidays while we were staying with my family for a week. I also had the chance to learn about how to make her famous Anginetti cookies and see if she would give me the recipe. When I was younger these cookies were unique to me as some were round, oblong, knotted or even braided. 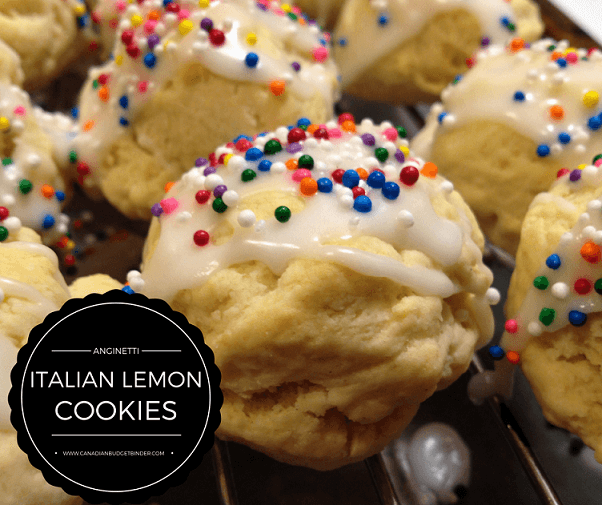 Italian lemon cookies are comparable to sinking your teeth into a dense yet soft cookie with a hint of sugar coming from the glaze and coloured sprinkles. 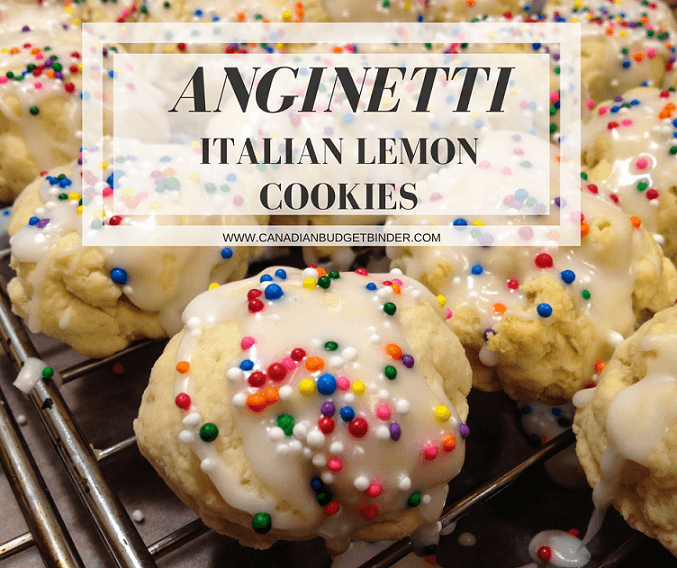 These Italian lemon cookies are not overly sweet and the variety of Anginetti flavours always keeps them interesting. You never knew what flavour you would get since Nonna piled them all onto a tiered cookie display in the middle of the table on top of a knitted doily. Italian Anginetti cookies take on many faces but they all taste similar depending on added extract flavours. Keep in mind that some Italian families may offer a certain variety based on the celebration as well. Over Easter you may find the lemon cookies are popular where Christmas cookies will be anise or amaretti flavour. It really depends on the Italian family of what traditional cookies they’ve adopted over the years. Personally, I think all varieties should be made for all occasions. Vanilla, Orange and Lemon also known as Fiori di Sicilia extract but without the floral essences. Italians use this to flavour Panettone, ice-cream, cakes, cookies, meringues and sweet breads. It’s also sugar-free and gluten-free. You might even find some of these Italian drop cookies offer lemon or orange rind for an even more powerful flavour which I chose to do with my updated recipe compliments of Nonna. Below are many of the names you will encounter just in case someone offers you one. At least you can say you know what they are now. I would have loved to add the Fiori di Sicilia however we don’t have that in our pantry as I have yet to find it. I may just have to order it online and have it shipped to the house. What I did do is create my own Fiori di Sicilia flavour without the orange for these Italian lemon cookies. I used a mix of pure vanilla extract, lemon oil and lemon extract to boost the flavour and fragrance of the cookie. This recipe makes about 30-35 medium-sized cookies big enough to dunk and fit in your mouth. If you make them smaller or larger you will obviously end up with a different number. 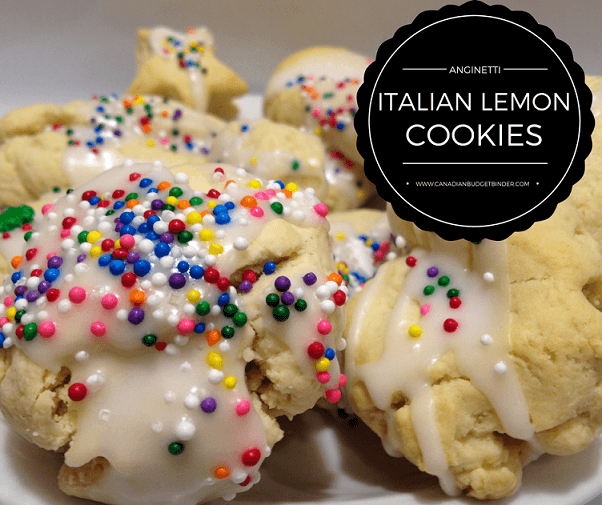 Italian Lemon Cookies also known as Anginetti are perfect cookies for Easter, Christmas, Weddings and for everyday eating and dunking in coffee. They are an affordable cookie which are easy to make, soft, fragrant, dunkable and most of all very pretty with the coloured sprinkles. Add milk starting with a tablespoon until desired consistency. You can always add but you can't take away. I used 4 tablespoons in total. on a lightly floured surface roll each ball into a rope 7" then pinch the ends together to form a circle. You can also drop the cookies by spoon onto the sheet, braid or roll in a ball and flatten slightly. The cookies will puff up so leave 2" minimum between each cookie and bake for 10-12 minutes or until golden on the bottom. Don't over-bake. I check after 10 minutes to see what the bottoms look like. Remove from the baking sheet to a wire rack to cool completely before icing. In a bowl add the confectioner's sugar, lemon extract, lemon oil and add milk starting with a tablespoon until desired consistency. If you prefer a light glaze add more milk if you prefer thick add less milk. You can always add but you can't take away. Dip the tops of each cookie into the glaze or frost if thicker icing and add coloured sprinkles of your choice immediately after. Let the icing firm before serving if a glaze consistency which is what I did. Store in the freezer for up to 6 months in a sealed container with wax paper in between the layers. Serve at room temperature with espresso, coffee or your beverage of choice. We made these Italian Lemon Cookies for Christmas and will make a batch for our Easter dinner with the family next Friday. I might get a bit fancy and add Easter coloured sprinkles of yellow, pink, green, purple on top or even some candy bunnies depending on what I find at the Bulk Barn. These are an affordable cookie which are easy to make, soft, fragrant, dunkable and most of all very pretty with the coloured sprinkles.